Pay for features you need and none that you don’t with the Onkyo TX-SR373, a future-ready AV hub that focuses on dynamic reproduction of the most popular multichannel soundtracks, including DTS-HD Master Audio and Dolby TrueHD, with surround calibration included. Discrete high-current amps love music: use Bluetooth® wireless technology with Qualcomm aptX audio to stream any music playing on your phone, tablet, or laptop with no loss in original quality. The Onkyo TX-SR373 decodes Dolby® TrueHD and DTS-HD Master Audio™, the most popular lossless multichannel soundtrack formats common to Blu-ray Disc™. Experience authentic movie sound as the director intended. Connect your players with just one cable linking to the TV for clean AV unit installation. HDMI terminals pass the latest video formats to your display, including those supporting 4K/60 Hz, HDR, BT.2020, and HDCP 2.2. 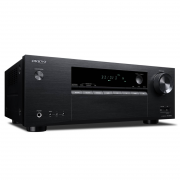 There’s also an Audio Return Channel (ARC) for amplifying TV broadcasts on the Onkyo TX-SR373. Discrete analog amps (not an all-in-one integrated circuit) deliver high instantaneous current to the speakers for dynamic audio reproduction. 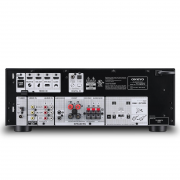 Controlled power is the cornerstone of Onkyo’s amplification philosophy. This gives the Onkyo TX-SR373 155 W/Ch (6 Ohms, 1 kHz, 10% THD, 1 Channel Driven) 80 W/Ch (8 Ohms, 20 Hz-20 kHz, 0.08% THD, 2 Channels Driven, FTC). Connect a compatible USB memory device filled with MP3, WMA, or AAC audio files to enjoy clear and powerful reproduction of your music. 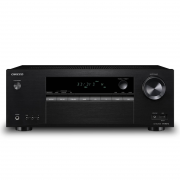 Quality D/A conversion and a selection of DSP listening programs further enhance sound to suit different kinds of music on the Onkyo TX-SR373. Bluetooth wireless technology mirrors whatever’s playing on your mobile device, laptop, or PC on the home theater. Devices* supporting Qualcomm aptX codec deliver virtually lossless low-latency playback, while original Advanced Music Optimizer mode enriches any compressed audio for a more satisfying musical experience. Connections to speakers and external devices are clearly labeled and illustrated on the rear panel. The connection diagram is readable upside down to make things easy when you’re leaning over the top of the receiver. 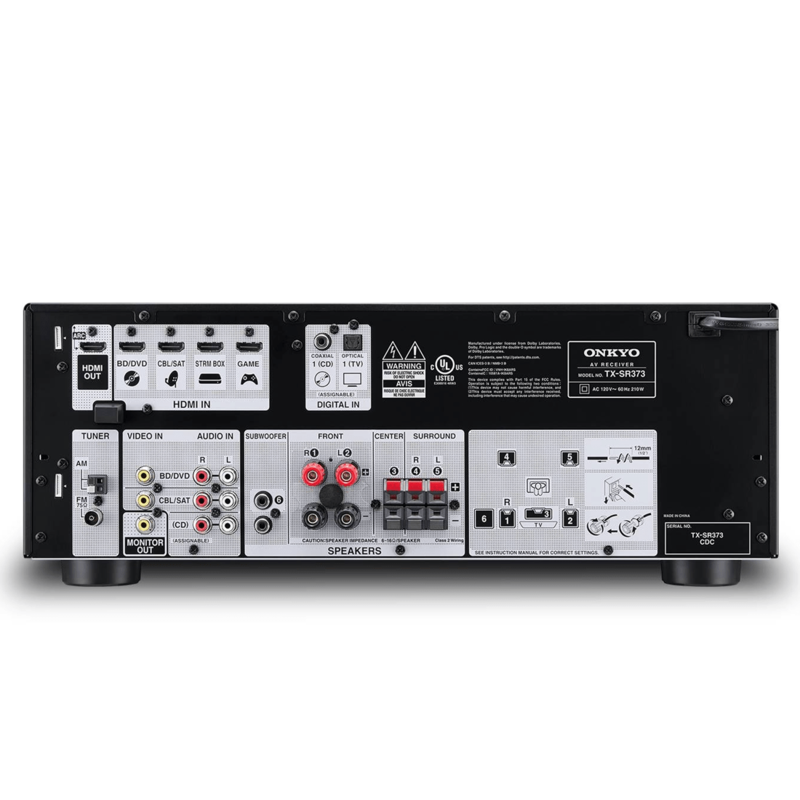 AccuEQ measures and corrects speaker distances, output levels, crossover frequencies, and frequency response from one quick and easy listening position to ensure clear and balanced surround-sound on the Onkyo TX-SR373.